INDIANAPOLIS (CNS) — As introductions were made and basic information was gathered, the voices of Chuck Konzelman and Cary Solomon were jovial and lighthearted. Konzelman and Solomon are the film’s co-writers, co-producers and co-directors. The two have been best friends since growing up next door to one another in New Jersey. They are both Catholic, live in Los Angeles and have years of experience in Hollywood. Solomon noted that he and Konzelman are a bit like the television duo Penn and Teller, where “I’m Penn, the one who talks,” he admitted with a laugh. The two worked together on the secular side of the film industry for about 17 years, writing for major studios such as Warner Brothers, Paramount, Sony-Columbia and 20th Century Fox, for well-known producers Joel Silver and Stan Lee and others, and for famous actors, Bruce Willis and Sylvester Stallone. In 2008, they felt called to “come over to serve the Lord” with their talents, said Solomon. Since then, they’ve co-written and/or co-produced numerous faith-based box office films. Movieguide listed their 2010 film “What If …” as one of the year’s top-10 family movies, and their 2014 movie “God’s Not Dead?” ranked among the top-35 grossing films that year. It also won Movieguide’s top award in 2015. Their last film prior to “Unplanned” was “God’s Not Dead: A Light in the Darkness” in 2018. Solomon recalled when, six years ago, he and Konzelman were “at our usual haunt, a coffee shop, talking about what we’ll do next,” when a woman approached them. “(She) tells us to read this book (‘unPLANNED’) and says we need to make it into a movie. I thought, ‘Yeah, sure — a chick flick! What do I know about being pregnant? '” Solomon said with a laugh. But they took the book anyway. The next day, Konzelman “came into the office with one of those looks,” said Solomon. “I said, ‘Are you OK?’ And he said, ‘You need to read this (book).’ The way he said it I could tell something divine had happened. I read it, and I agreed it was definitely a story that needed to be told” on film. Four years later, working in the office of their production company, Believe Entertainment Inc., they looked up at one another and “knew at that very moment” it was time to make the film, said Solomon. To write the script, Solomon said interviews with Johnson were done early on. They relied on her eight years of experience working in the abortion industry for the technical information. For authenticity, even the actors portraying the abortion doctor and nurse in the film are an actual former abortion doctor and nurse who, like Johnson, “had already ceased doing that work and come to the Lord,” said Solomon. 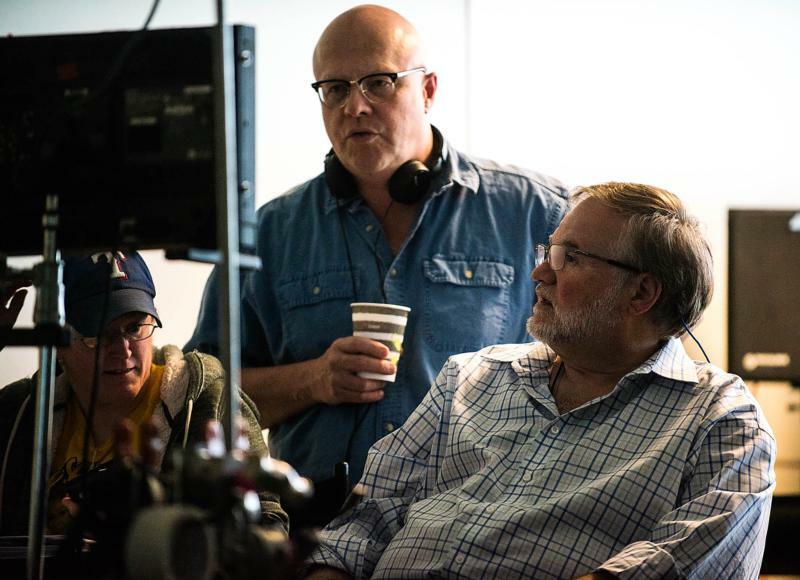 When asked how the filming of “Unplanned” differed from their other Christian movies, Konzelman said, “None of the other projects needed privacy. Usually when you’re filming, particularly a faith movie, you look for all the publicity you can get. “But we knew there was a strong possibility of protests or sabotage, so we shot the film under an assumed name, and we filmed in secret” in a studio in Stillwater, Oklahoma. “Somehow by the grace of God, in an age of social media,” there were no leaks about the film, Konzelman said, despite a cast and crew of 1,000 people. For example, Solomon talked about a woman who was “pro-choice and very, very sick with lupus,” who had somehow gotten hold of a screenplay of “Unplanned,” and after reading it “she became pro-life and desperately wanted to be involved in the film,” he said. But when she arrived at the set, the woman suddenly began to cry. One of the many priests and ministers frequently present on the set was called over — and the woman confessed to having an abortion at 19. “She was just standing there crying about this abortion — and right then and there, she was miraculously healed” of her illness, Solomon said with a bit of awe in his voice. She did go on to do office work for the project. Solomon’s favorite conversion story hits closer to his heart. “My dad is 84, an atheist, liberal, pro-choice, far left, get-along-go-along, everything-is-allowed-and-permissible kind of guy,” he explained. He asked Solomon to send him a clip from the film, which was still being shot. Solomon sent his dad a 10-second clip from a scene of pro-life advocates holding their hands through a Planned Parenthood fence, praying over a barrel of dismembered baby parts. The movie itself almost came to an end one day when its account had a mere $13.17 remaining, with filming yet to go. The man was Michael Lindell, inventor of My Pillow and CEO of My Pillow Inc. And more importantly, a devout Christian. He said he had been praying and felt called to make a $1 million donation to the directors — one-sixth of their $6 million budget.